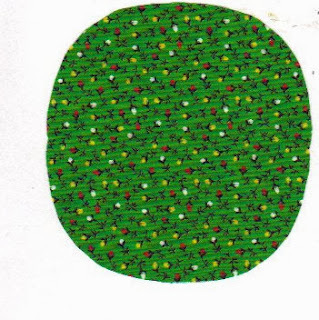 You've probably started your Christmas crafts already, but there is always time for more fabric slashes and stitches to round out the holidays. 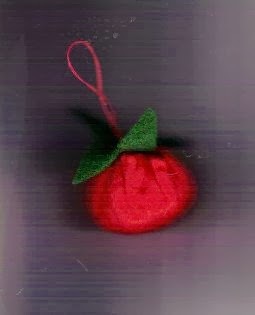 I'm making some fruit Christmas ornaments from cotton, satin and felt scraps and thought I would share them with you. These are made entirely by hand, so you can make them while watching television or chatting. 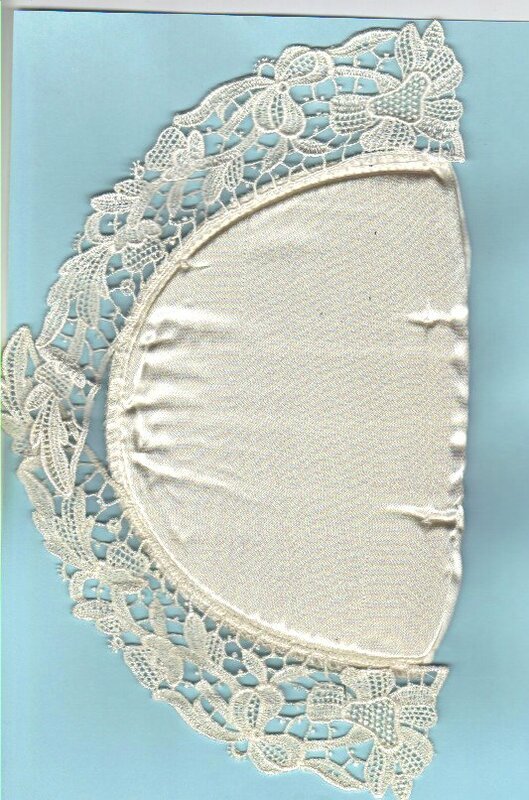 You'll need a needle and thread and fabric scraps. My grandchildren are 2 this year, so not all ornaments are safe, and the wire hangers we all use are especially unsafe for little ones. 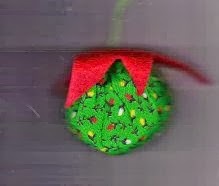 You can make ornaments small children can enjoy by using fabrics and thread, with thread hangers. As the children get older, you may want to add decorations that you can't use now -- buttons, beads, sequins or rolling eyes. You still have to watch a small child with any Christmas ornament, especially if he still put things in his mouth. These are all simple, but original patterns and ideas you are welcome to try. Start with scraps of fabric and choose some shapes you'd like to hang on a tree. A large tree will need full-size shapes; a small tree can use small ones. Here are some of the fruits you can make, with a little imagination: Strawberries, apples, lemons, cherries, tomatoes, cherry tomatoes, oranges, and maybe grapes, with lots of patience. All the round fruits take a full circle, just like yoyos. A 2 or 2 1/2 inch diameter circle makes smaller fruit, and a 3 1/2 inch circle makes larger pieces of fruit. Choose a color that resembles the fruit, but it doesn't have to be solid colors. Cherries, strawberries, tomatoes, cherry tomatoes, red apples can be made from shades of red fabric. Represent lemons and star fruit with yellow, and grapes with purple or green. Cut the circles for the size fruit you want to make, except for the strawberries. Use a larger circle cut in half and make two strawberries from one circle. See more directions below for the strawberry. 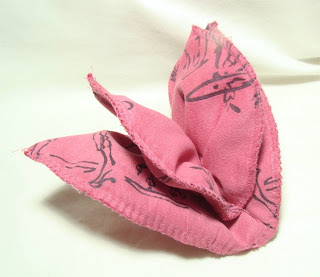 Fold about 1/4 inch at the wrong-side edge of the circle and secure the thread with a couple of stitches on top of the knot-- you'll be pulling on it later and need it to be anchored. 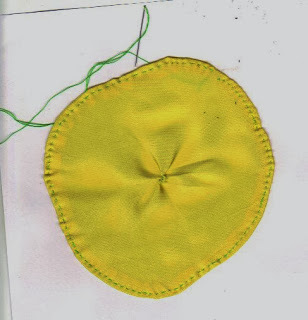 Stitch around the circle with wrong sides together until you get all the way around. For a lemon, I take a few tacking stitches in the center to resemble the bottom and use a round green circle for the top. 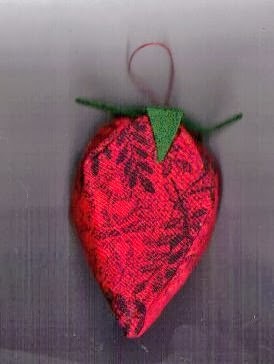 For the strawberry, fold a half circle in half with right sides together and stitch up the side. Tack. 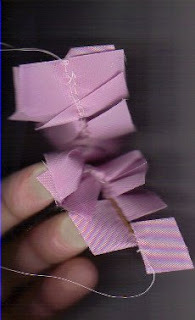 Fold about 1/4 inch of the raw edge at the top, wrong sides together and tack the thread. Straight stitch around the semi-circle until you're all the way around. Turn the strawberry so the inside can be stuffed. I use felt for filling the fruit -- scraps, strips, small pieces left over. 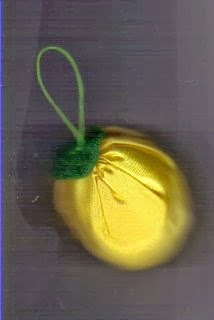 Once the fruit is stuffed, pull the thread to gather it tight at the top. Take a few stitches to secure it, then add a top piece. 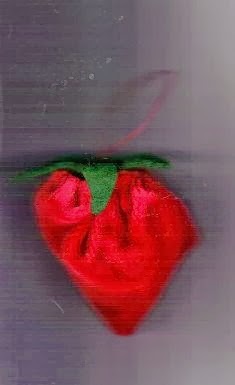 A cap for a strawberry or tomato looks like a star, or you can add a stem for an apple, or leaves. Secure the top, then loop the thread two or three times to make a hanger for your fruit. Tack the hanger loops in place and cut the thread. Your fruit Christmas ornaments don't have to look real. You can make fictional pieces and let the children imagine what fruit they represent. Children love magic, and may find that the best Christmas ornaments don't represent anything they've ever seen. We hope you get pleasure from crafts and creating safe and inexpensive Christmas ornaments, and that you have a wonderful Christmas season! 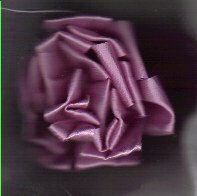 Ribbon embroidery pins, pendants, bracelets or Christmas ornaments are creative crafts with fast results. Make your own design or purchase a book of small designs. 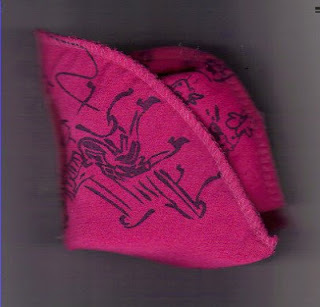 You can make your miniature needlework item square, round or heart shaped. 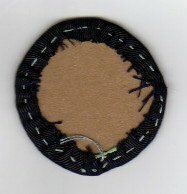 I started with about a 3-inch circle, using a template cut from cardboard, and used black moire fabric for the background. 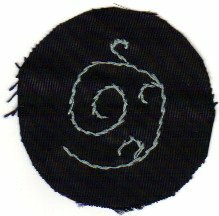 I cut the moire to the 3 inch size, but started the embroidery about half to three-quarters of an inch from the edge all around. 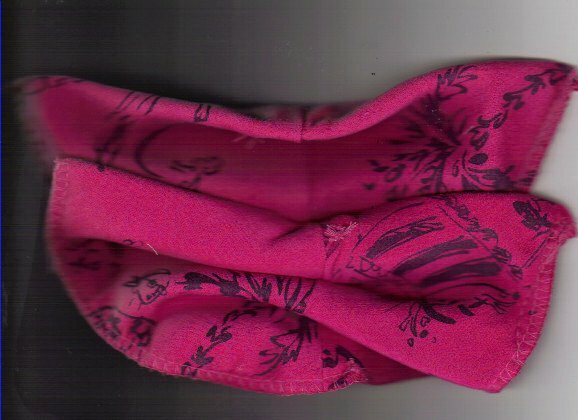 The design is worked without an embroidery hoop and without a pattern. 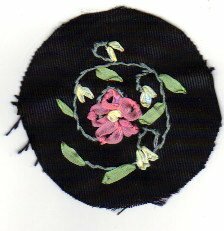 If you want to use an embroidery hoop, stitch your little piece of fabric onto a larger one, and cut out the middle of the large piece of fabric where the stitching will be done. 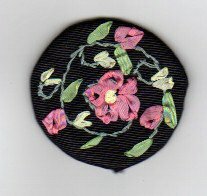 Two-strand embroidery thread creates the circular stem with stem stitch (like a back stitch) and 4mm silk ribbon in pink, yellow and green are used for flowers and leaves. 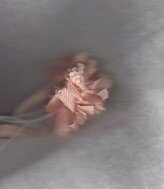 Stitches are Japanese ribbon stitch, lazy daisy and a French knot in the center of the large flower. Once you complete the front of the item, cut another cardboard circle to use for stiffener. Make it about an inch smaller in diameter than the original circle. Cut a piece of felt the same size as the cardboard circle. Sew around the edge of the fabric and place the cardboard on the back inside the stitching. 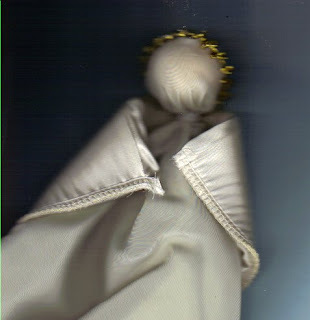 Gather it all around and backstitch a couple of times to secure the gathers. (I used a color you could see, but you'll want to use a color that matches the background fabric.) 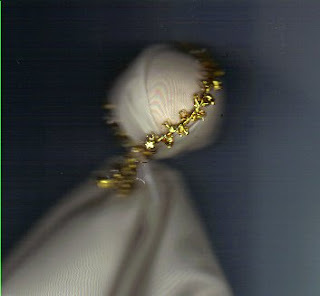 Cut the thread. If you're making a piece of jewelry such as a pin or pendant, decide how you want to attach the pin. You can glue a metal purchased pinback to the cardboard, or punch it from front to back in the cardboard. A pendant can be hung with a purchased slide or you can use a piece of silk ribbon attached at the top before adding the felt back. 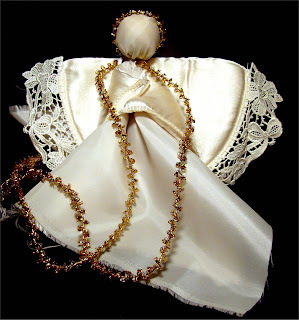 A Christmas ornament can also hang with silk ribbon. Secure the felt to the back with hand stitches along the edge or glue if you prefer. American School of Needlework's Big Book of 101 Little Ribbon Embroidery Designs with designs suitable for jewelry or Christmas ornaments. 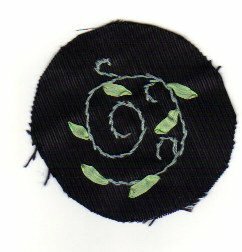 Other ideas: You can use a large button instead of cardboard, and attach the fabric to the button before you start the embroidery. 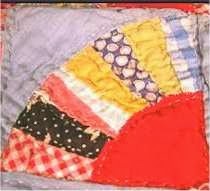 If you like to quilt, you've probably tried several different methods and may have made different styles of quilts. Most piecework involves piecing the same block in different colors of fabrics, but sometimes that gets boring. 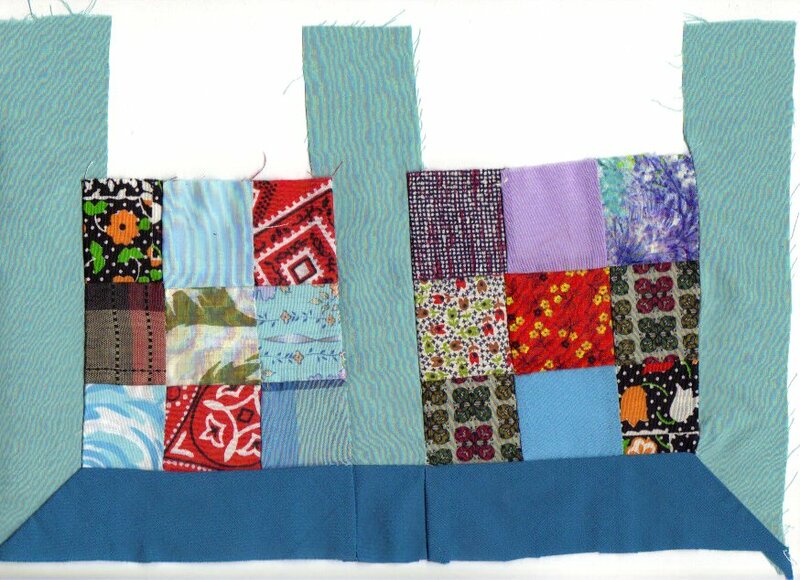 Have you tried to make a sampler quilt with the same fabrics and different patterns for the blocks? You can make each block different and keep your interest level high. You can even choose to applique some blocks and piece others. 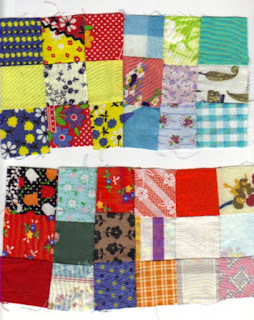 So long as all of the blocks are the same size, your quilt will fit together. Repeating some or most of the fabrics will make it look like it's made to go together. 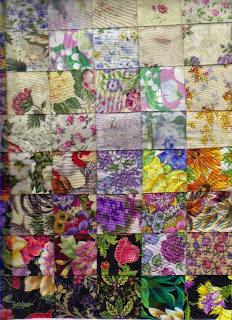 Block by Block by Beth Donaldson is a 1995 publication with 12-inch square blocks that could be used together to make a single quilt. That's the key to making a sampler quilt easily. This book doesn't have all the blocks I used, but it has enough to keep you busy and give you ideas for more. I also used Best Loved Quilt Patterns from Oxmoor House (1987) for more designs. Choose 10 1/2 inch, 12 1/2 inch, 14 1/2 inch or 16 1/2 inch squares so your blocks will line up without having to add individual sashing or additional pieces. 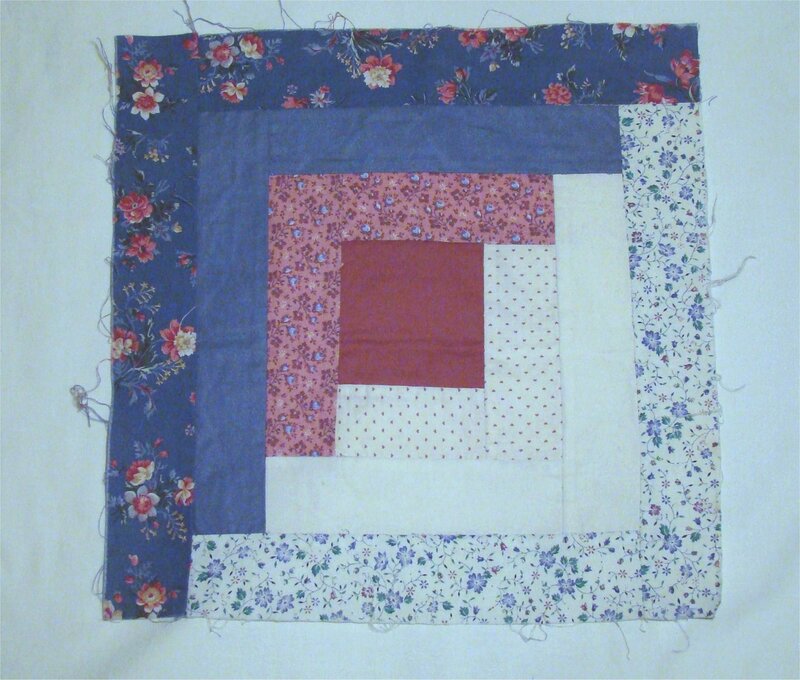 We add the half inch for 1/4 inch seam allowance all around to have a full size square with an even number of inches when the quilt is completed. Choose your patterns. 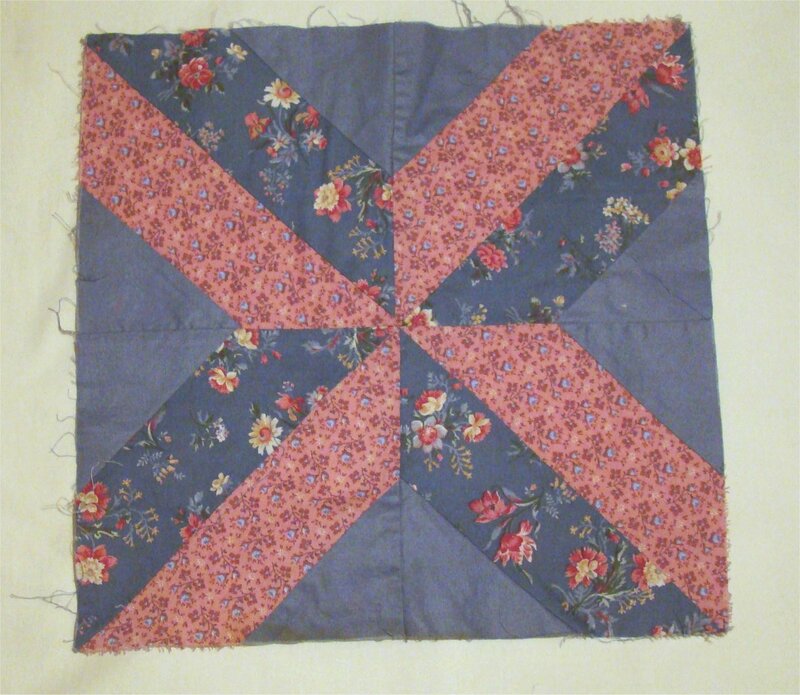 Patterns used in this quilt are 14-inch squares and include a six-section fan block, a log cabin block, a nine-patch with applique leaves, a butterfly applique, card trick pieced block, grandmother's fan applique on backing, rail fence, churn dash and a couple of others. Choose the fabrics. You don't need many different ones. I chose blue and pink with beige for my sampler. 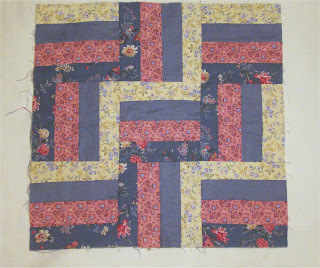 You may want to select fabric for sashing strips between the blocks, too. 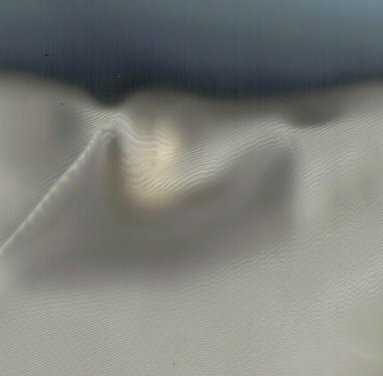 Wash and press the fabric. Cut any full-size squares you need for backing the applique designs. Remember to add the 1/2 inch for seam allowance. Sometimes I cut these an inch larger than I need and trim after the applique is done. 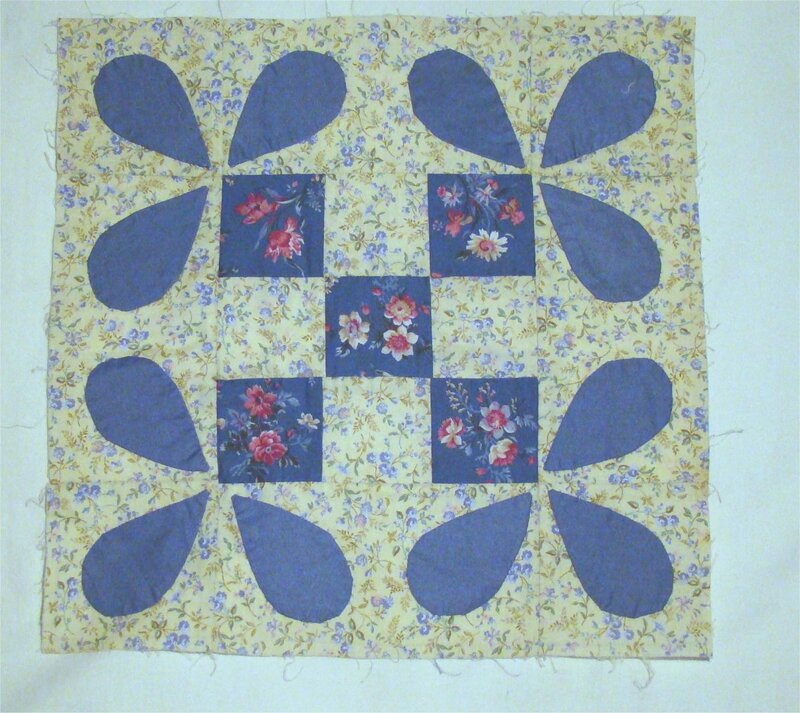 For a 14-inch block, I make the backing square 15 1/2 inches, then trim to 14 1/2 after the applique is completed. 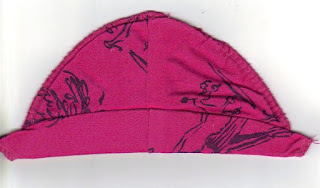 That allows for any shrinkage from complex applique stitching. 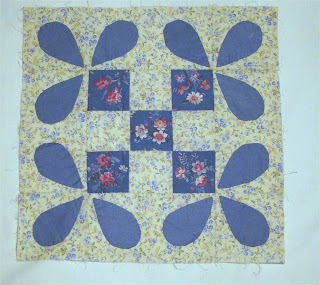 Use a rotary cutter for cutting squares, rectangles and triangles for quilt blocks, but use sharp scissors for applique pieces. 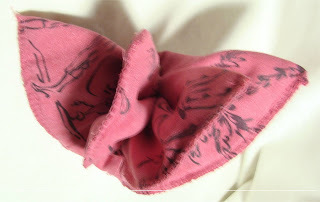 If you're hand appliqueing the design, add 1/4 inch to all outer edges to fold under. Where the fabrics overlap, don't add to the applique piece that will be on the bottom since it doesn't have to be folded under. 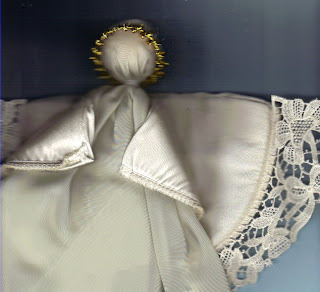 The wings of the butterfly where the body is appliqued over them is an example of overlap that doesn't need the 1/4 inch addition. If you're machine appliqueing the design, don't add to the template. You can use a fiber bonding fabric like HeatnBond or Wunder-Under on the applique pieces, but they won't have the softness of a cotton quilt. 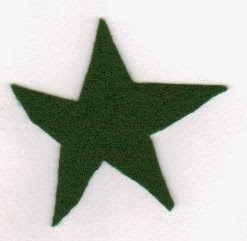 If you use freezer paper for hand applique, cut the freezer paper to the size of the template. Apply the freezer paper shiny side up (wrong sides together) to the back of the cut applique piece and turn the 1/4 inch fabric edge with an iron, or you can use your needle to turn the fabric under as you work around the edge. Trim all the blocks to the same size, allowing 1/2 inch for seams. Your blocks should be 14 1/2 inches square at this point if you're working with 14-inch blocks. 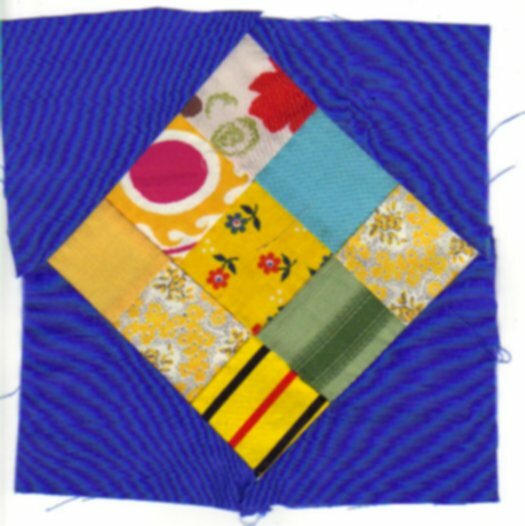 Once you've made individual blocks of different kinds but with similar or the same fabrics, you're ready to design your quilt. Sashing between the quilt blocks will make a larger quilt and require fewer blocks. You can also add a row or two of sashing around the outer edges to make the quilt larger. 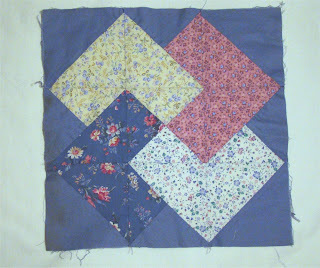 Sashing works with square blocks but not for blocks set on point (like diamonds). 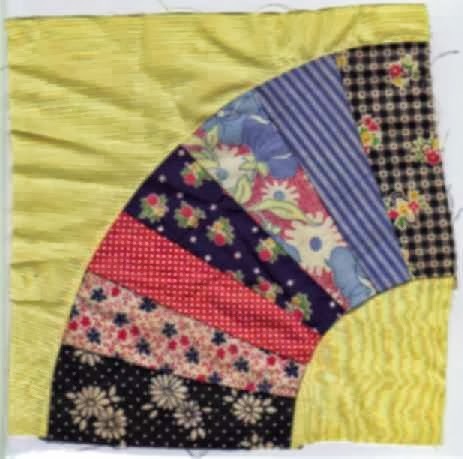 Before you finalize your sashing choice, lay the fabric out on a flat surface and place your quilt blocks on it to see the effect. I used a small beige and brown background print for this one. If it's not what you want, look through your fabric stash and try some other fabrics until you get one you want to work with. 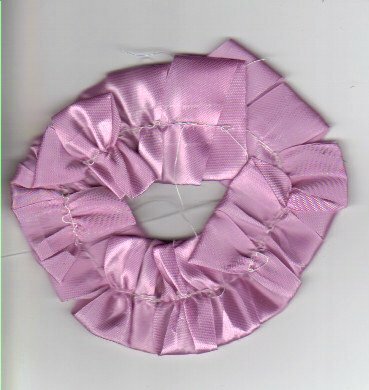 Wash it if you haven't already, and cut the sashing in 3 1/2 inch, 4 1/2 inch or 5 1/2 inch width, as you'll need the 1/2 inch for 1/4 inch seams. I cut sashing parallel to the selvage -- it stretches less. If you start at the selvage edge, trim off the bound selvage edge, then cut your first strip at the cut edge and work across the doubled fabric. That way, if you have fabric left over, it will be near the fold. The remaining piece will be folded, giving you a larger surface for your next project. You may even have enough for backing blocks for more appliques. P.S. Before I complete this quilt, I'll take the lace off the Grandmother's Fan block. 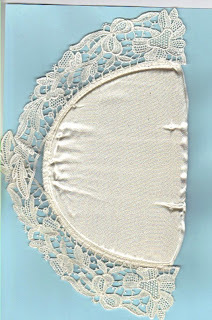 I may add a feather stitch or an embroidery stitch I use for crazy quilting, or even eyelet lace would work. 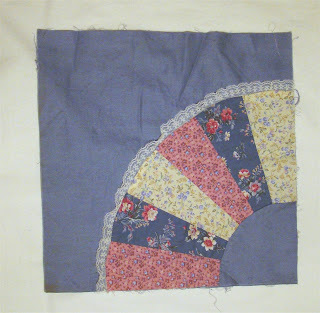 The thin lace will wear out before the other fabrics and is impractical for a usable quilt. 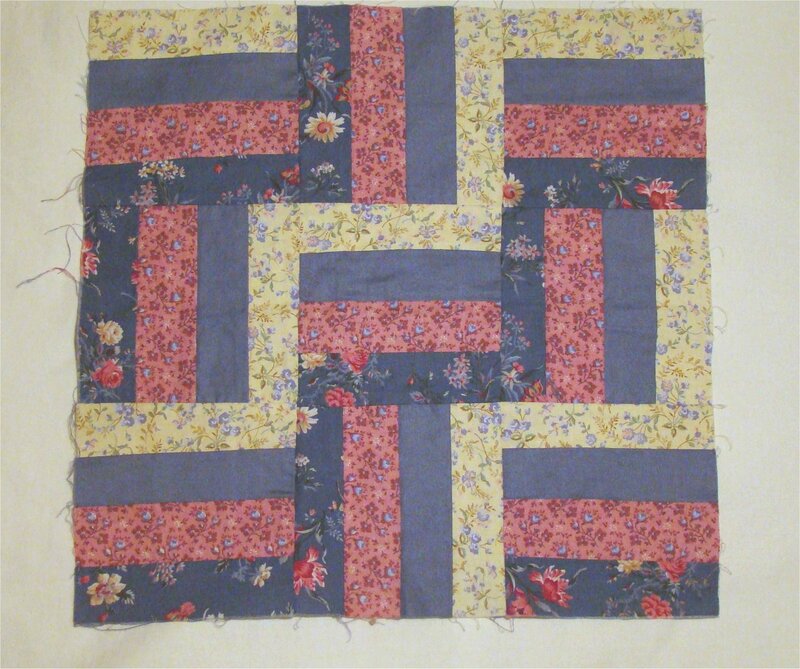 Quilting is always a learning experience! 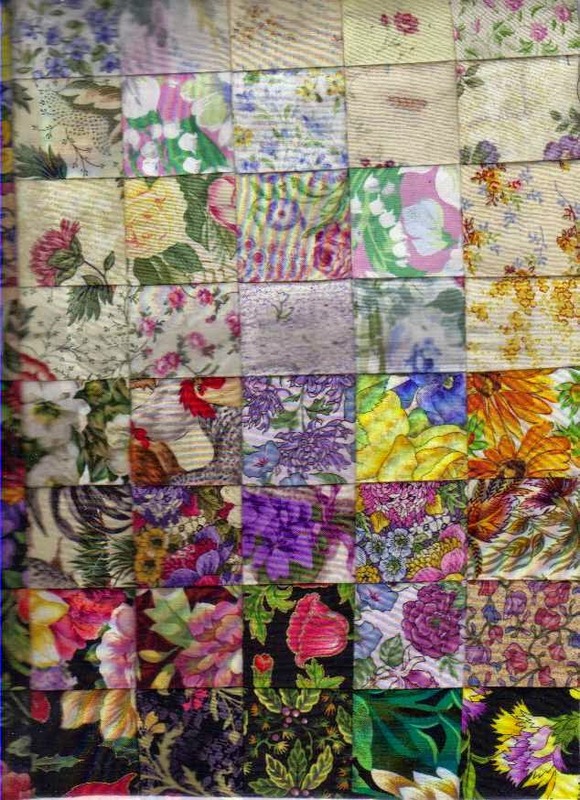 From the crafty lady who makes flowers from old zippers, here's another outrageous but fun fabric crafts project, and it costs you nothing. 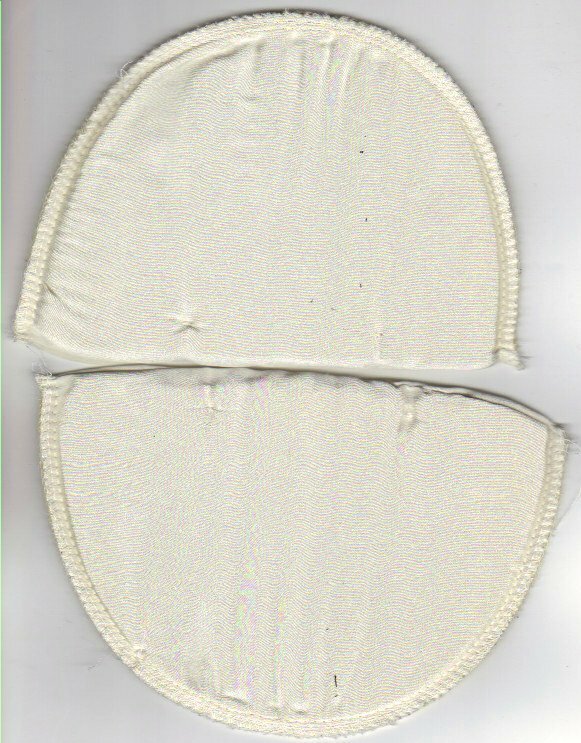 Shoulder pads are still available in ladies shirts and coats, and most can be removed with a few snips of the scissors. Most women remove them to avoid the linebacker look -- and most toss them in the trash. If you like recycle crafts, this is an easy one for you. You don't even need a sewing machine -- all the stitching can be done by hand. You'll need two shoulder pads approximately the same size and shape, along with matching thread. You'll also need a sewing needle or a sewing machine. 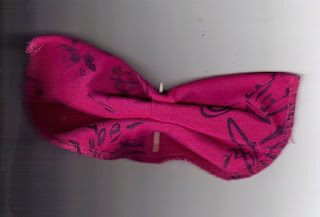 If you want to use the butterfly for your hair, you'll need a clasp or comb of your choice. You can also use the 3-dimensional butterfly for pillows, purses or other crafts projects. 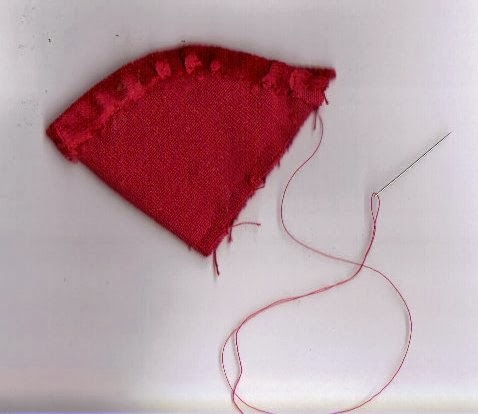 Fold the straight edge of one shoulder pad about an inch down and tack in the center only. The fold should be facing you. Accordion fold the second shoulder pad and place it on top of the first one, centered. Stitch the center line to hold the accordion-folds in place. 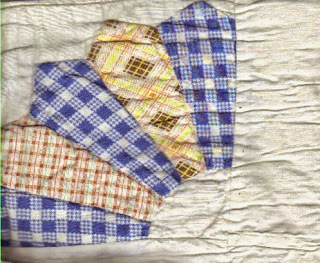 You can use the butterfly for pillows, quilts or wall hangings in this form, but to make it three-dimensional, you'll need one more step. 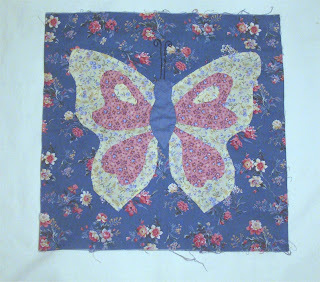 Fold the butterfly in half from the back through the center and stitch from side to side about 1/2 inch through all fabrics, unless you choose to leave it flat. 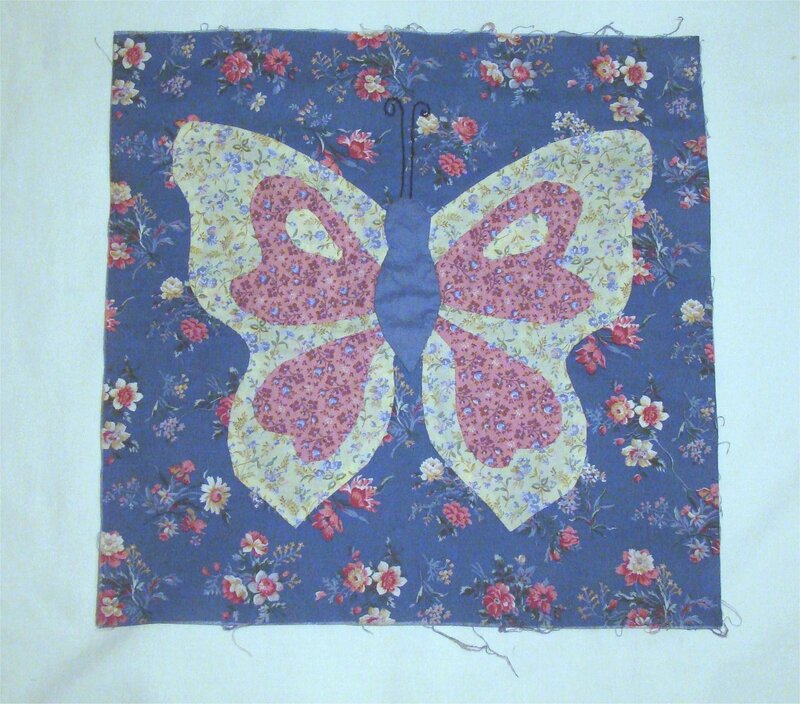 You can also attach your completed fabric butterfly it to a linen, straw or fabric handbag, or add lace to the edges to make it larger. You may choose to embellish it with embroidery or beading, especially if you use solid color shoulder pads. 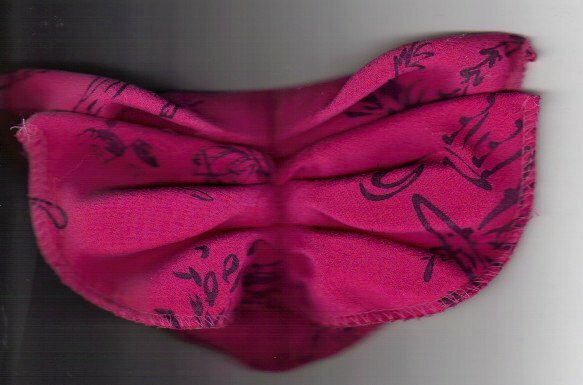 Shiny shoulder pads make the butterfly have an iridescent quality, so don't hesitate to use whatever you have available. This is our personal crafts idea, and we're delighted to share. 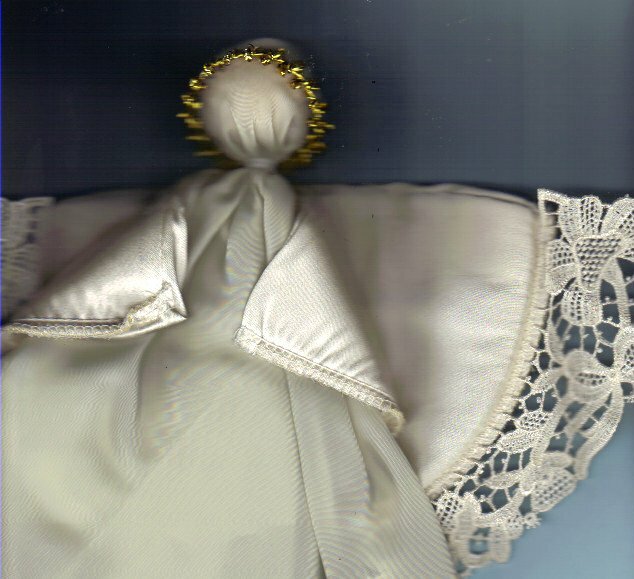 We also make angels from shoulder pads that we've featured in a previous article. I'll have to find it for you or write out new instructions for it.